WASH Advisor (YEP) working for SNV Kenya on the peri-urban sanitation project in Nakuru. 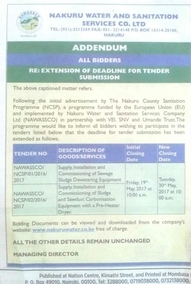 This EU-funded project was a joint partnership of the Nakuru Water and Sanitation Services Company (NAWASSCO), Vitens Evides International (VEI), Water and Sanitation for the Urban Poor (WSUP), Umande Trust and SNV that aimed to demonstrate and upscale an innovative sanitation value chain for the (peri) urban low income areas in Nakuru County, Kenya. Equipped with quantitative and qualitative research skills and trained in facilitating participatory workshops and training. Experienced in the development of knowledge development products, report and proposal writing and relationship building. Worked in Planning, Monitoring and Evaluation. Education: MA in Poverty and Development, trained in participatory methodologies, Institute of Development Studies (IDS), University of Sussex, Brighton, United Kingdom. BSc in Cultural Anthropology and Development Studies, Radboud University of Nijmegen, the Netherlands. Minor in Conflict Studies. Centre for International Conflict Analysis and Management (CICAM), Radboud University Nijmegen, the Netherlands. Field research in Thailand and Sri Lanka and desk research for academic projects attached to universities in the Netherlands and the United Kingdom. Worked as the Communication and Relationship Manager for an international NGO in Tanzania before joining SNV as the Strategy Intern for East and Southern Africa and thereafter Planning, Monitoring and Evaluation consultant in Kenya.